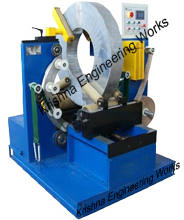 Krishna Engineering Works have been manufacturing, exporting and supplying Coil Wrapping Machine from India. Also, high quality machines, fully automatic machine, heavy duty Coil wrapping Machine also, the coil shaped products in a spiral style through eye of the product. Featuring with Modularized electrical control box, also, Smart & compact design- 8 units in a 20′ container. Our Coil Wrapping Machine mostly used in different industry for metal band, pipe bundle, vehicle tyro, wire coils and many more. We are also leading manufacturer of flexible packaging machinery like Slitter Rewinder Machine, Winding Rewinding Machine.